Distinguished Professor Margaret Brimble CNZM, FRS is the Director of Medicinal Chemistry at the University of Auckland where her research program focuses on the synthesis of bioactive natural products, antimicrobial peptides, cancer vaccines, glycopeptides, self-assembling peptides, peptidomimetics for neurological diseases and the development of new organic compounds for agritech applications (e.g. methanogen inhibitors, rat selective toxicants, nitrification inhibitors and sanitizers for bovine mastitis). She has published >460 papers, 60 reviews and is an inventor on >30 patents. In 2018 she was elected a Fellow of the Royal Society London and was awarded the Royal Society of Chemistry George and Christine Sosnovsky Award in Cancer Therapy. She won the 2016 Marsden Medal, the 2012 RSNZ Rutherford (NZ’s top science prize), MacDiarmid and Hector Medals, the 2011 Royal Australian Chemical Institute Adrien Albert Award, the 2010 RSC Natural Products Award, the 2007 L’Oreal-UNESCO Women in Science laureate in Materials Science for Asia-Pacific, a 2015 IUPAC Distinguished Women in Chemistry/Chemical Engineering Award and conferred the Queen’s Honour CNZM. 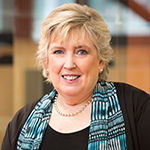 She is Past-President of IUPAC Organic and Biomolecular Division III, an Associate Editor for Organic and Biomolecular Chemistry, Past-President of the International Society of Heterocyclic Chemistry and Past-Chair of the Rutherford Foundation RSNZ. She discovered the first drug named “trofinetide” to treat Rett Syndrome and Fragile X syndrome that is in phase III clinical trials with Neuren Pharmaceuticals. Trofinetide is New Zealand’s first successful drug and one of only a few to be discovered in an academic laboratory. Margaret also co-Founded the spin-out company SapVax with US$6 million funding from BioMotiv USA to take self-adjuvanting cancer vaccines based on a novel chemistry platform, to clinical trial.